Simple's Clear Skin Oil Balancing Face Scrub is definitely one of the best facial scrubs I have ever used. Suffering from combination skin, this has immensely reduced the amount of oil on my T-zone and has also helped combat my open pores. This scrub contains 3 skin loving nutrients and these are Witch Hazel which helps reduce blemishes, Natural Zinc PCA which gently absorbs excess oil and Rice Powder which exfoliates and smooths skin. As well as containing these 3 nutrients, it also contains 2 vital vitamins; Vitamin E which powerfully moisturises and improves skin condition and Pro-Vitamin B5 which actively restores, softens and soothes skin. However, the best thing about this product is the fact it contains no perfume, no colour and no unnecessary or harsh chemicals therefore making it perfect for my sensitive skin. I never used to wear eyeliner on my eyelids purely due to the fact I always struggled to apply it. However, after trying out Maybelline's Gel Eyeliner, I started to enjoy using it so thought I'd give an eyeliner pen a try so picked up this one from Seventeen and found it very easy to use allowing you to apply a thinner, natural looking line or a thick, bold line. This is my current everyday foundation and the reason I love it is because it feels so lightweight on my skin but gives me just enough coverage . This foundation offers Advanced Smart-Tone Technology which means it reveals a flawless cover no matter what light you are in. Furthermore, it is enhanced with Sapphire Radiance for an illuminating glow that never falls flat. Another reason why I love this foundation for everyday use is because it contains an SPF of 15 therefore protecting your skin against sun damage. Although this product is just slightly over £10, I chose to include it because I absolutely love it. This blush creates a stunning rosy glow and beautifully illuminates my cheek bones making it the perfect blush for all occasions. I adore Barry M gel nail polishes because they provide an extra glossy finish in just one coat (although I still apply two due to force of habit)! They are highly-pigmented, chip resistant and are available in a huge range of colours. Whether you have long hair, short hair, an afro, a weave or even hair extensions, the Tangle Teezer is perfect for you. The Tangle Teezer is a revolutionary hair styling tool which will effortlessly and most importantly painlessly detangle and smooth your hair into perfect condition. What's brilliant about this hair tool is the fact it dramatically reduces hair breakage, splitting and damage. I have quite a few brushes from the Real Techniques collection and this is definitely my favourite for applying foundation. The RT Expert Face Brush is an ultra firm brush making it perfect for applying and blending liquid or cream foundation. Although I do love this brush for applying my foundation, I do like to buff it in afterwards with the RT Buffing Brush from the Core Collection. I've only been using this for a couple of weeks but I have already fell in love. Suffering from combination skin, I frequently have breakouts of my chin and this has helped reduce them immensely. This refreshing toner is perfect for blemished skin and gives a beautifully matte, shine-free finish. It helps remove traces of make up, cleanser and impurities whilst mattifying powders to leave the skin shine free. Furthermore, this has been clinically proven to give clearer looking skin. Again, like the S&G blusher, this is slightly just over the £10 mark. Like the Tea Tree Toner, I have also only been using this for a couple of weeks and have again fallen in love with it. This Seaweed infused mask leaves skin looking clear by drawing out impurities and helps control excess oils leaving your skin looking refreshed. If like me, you love painting your nails but hate waiting for them to dry then this is perfect for you. This Pretty Perfect Nail Drying Spray speeds up the nail drying process making your nails touch try in almost 60 seconds. All you do is paint your nails as normal and then spray this on top. 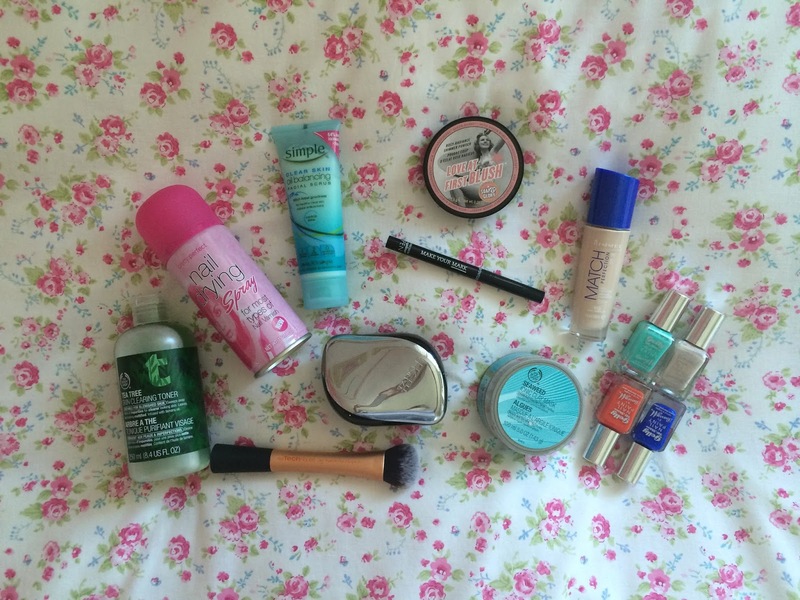 What beauty products do you love that cost under £10?